Perhaps encouraged by that David Brooks column in which he swoons over the “responsible elite,” people in Mitt Romney’s circle are putting out vibrations of another presidential run in 2016. The Washington Examiner’s Byron York revealed all in a Wednesday column (“Romney 2016 Is for Real”), reporting that “Romney is talking with advisers, consulting with his family, keeping a close eye on the emerging ’16 Republican field,” and earning chits by campaigning for U.S. Senate candidates this autumn. “He is keeping his hand in things.” York writes. The Romney trial balloon may just be a way to push someone else into the race. York’s sources say that Romney would not run against former Florida governor Jeb Bush, who hasn’t yet answered entreaties to become the We Might As Well candidate going into the 2016 primaries. Bush, like Romney, is seen as someone who wouldn’t hurt the party brand, even if he reinforces its dynastic image. So he’s not the ideal candidate to counter concerns about wealth concentration (see this week’s chart showing that the top 10 percent have enjoyed almost all of the nation’s income growth since 2001). No matter. It’s more important to the Republicans that he’d defend wealth concentration with utter sincerity. And maybe neither Romney nor Bush would end up beating Hillary Clinton in Northern suburbs, but at least they wouldn’t scare people into voting straight Democratic tickets all the way down to water commissioner. The Upshot’s Justin Wolfers got over his incredulity toward another Romney run by checking out the prediction markets (i.e., bookies), which now place Mitt behind Florida Sen. Marco Rubio, Bush, Kentucky Sen. Rand Paul, and New Jersey Gov. Chris Christie — and ahead of Texas Sen. Ted Cruz, Texas Gov. Rick Perry, and Wisconsin U.S. Rep. Paul Ryan, among others. Rubio is presumably on top because he’s from the biggest swing state (Florida), is Hispanic, and is relatively young (43), good for a party that is dangerously dependent on the Social Security set. But Rubio and New Jersey’s Christie may not play well outside their home states. As for Rand Paul, the GOP establishment probably still doesn’t know quite what to make of him. Would he really run as an isolationist against a hawkish Hillary Clinton? When he makes skeptical comments about the War on Drugs and the industrial-incarceration complex, is he just looking for attention, or would a President Paul actually put try to get reforms through Congress, even if it meant working with Democratic members? Romney is the safety candidate, someone who could block the nomination of a too-unpredictable Paul — or Cruz or Perry or anyone just too Republican to win a general election. Cruz, who has called for bombing the terrorist quasi-state ISIS “back to the Stone Age,” is especially notable as someone scary enough to lose in November no matter how bad the economy or how low Obama’s popularity. If such a risky candidate wins the Iowa caucuses and South Carolina primary, Romney has a good chance of quashing the revolt by repeating his past wins in the New Hampshire and Florida primaries, then sweeping the big states with expensive media markets. 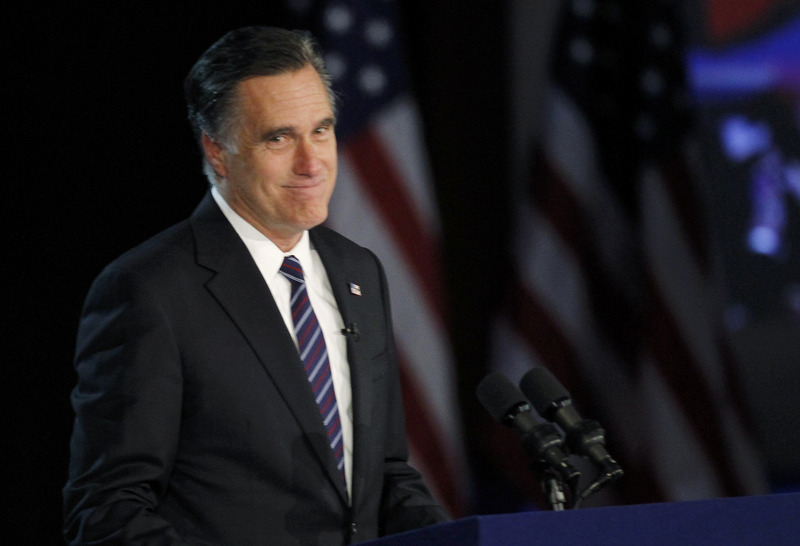 A Romney run isn’t inevitable or even probable. Right now, it’s just a poke to party leaders, who are behind schedule in finding a consensus candidate akin to George W. Bush in 2000. (So is the rumor, or threat, of a run by Indiana Governor Mike Pence.) If he ends up with the nomination a second time, it will hardly be his fault.